The trident-halberd originated during the Ming Dynasty. It has a 0.5-meter-long sharp steel head with a crescent crosspiece, fixed on a 2.5-meter long shaft. At the end of the shaft is an iron taper. 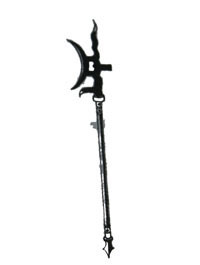 The trident-halberd was used for hitting, thrusting and blocking. As it is long and heavy the users must be tall and strong. Similar kinds of trident-halberd include phoenix-wing, swallow-wing, dragon-beard, ox-head and gilded halberd. The playing techniques include throwing, patting, holding, hiding, pushing, turning, supporting and blocking. The basic stances include thrusting and twisting, straight attacking, dragon-riding, jumping over and hiding below. In trident-halberd play there are no dancing movements and turning is the main action. For holding the weapon, one hand is in the front and another below and the two hands could change positions. The routines include swallow-wing play.